Cover White Chocolate-Peppermint Pudding Cookies with crushed peppermint candies. 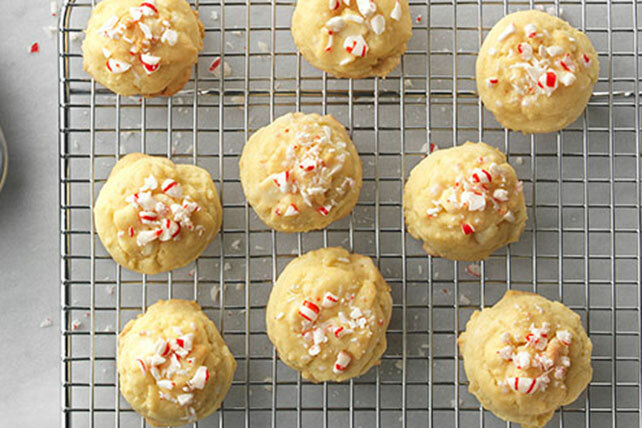 These White Chocolate-Peppermint Pudding Cookies are great for gifting. Mix flour, dry pudding mix and baking soda until blended. Beat butter, 1 cup sugar and extract in large bowl with mixer until light and fluffy. Blend in eggs. Gradually add flour mixture, beating well after each addition. Stir in morsels. Bake 8 to 10 min. or until lightly browned. Cool on baking sheets 1 min. Remove to wire racks; cool completely. Mix remaining sugar and water until blended; brush onto cookies. Sprinkle immediately with crushed mints. If baking these cookies in high-altitude areas, increase the baking time to 9 to 11 min. or until edges of cookies are lightly browned. Chop 1-1/2 pkg. (4 oz. each) BAKER'S White Chocolate (6 oz. ); use instead of the chocolate morsels.